Boasting spectacular swimming pools, stunning sea views, water sports and a night club, this resort is a standout for its size and the spectacular selection of services on offer. Parents will love the Daisy and Teen Clubs which feature a full program of entertainment for kids from 4 to 17. The fun doesn't stop at night either because this resort also includes with a theatre, bowling and a wide array of bars and restaurants. The resort comprises four areas, each with a distinct set of offerings: Daisy, which is ideal for families with children; Privilege, an exclusive section offering VIP services; Edén, offering direct pool access and the adults-only El Beso. Rooms and suites are contemporary in their design and feature a wealth of amenities for your comfort and convenience. 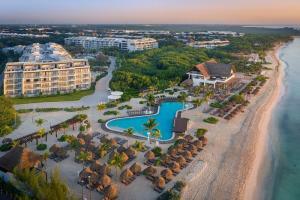 This resort is located on the beach in Playa del Carmen. Approximately 33 miles from Cancun International Airport.